Carpet One has 1,000 showrooms throughout North America, Australia and New Zealand. Each one carries a range of carpet, hardwood flooring, laminate and tile. The company is less of a flooring store, and more a buying club. 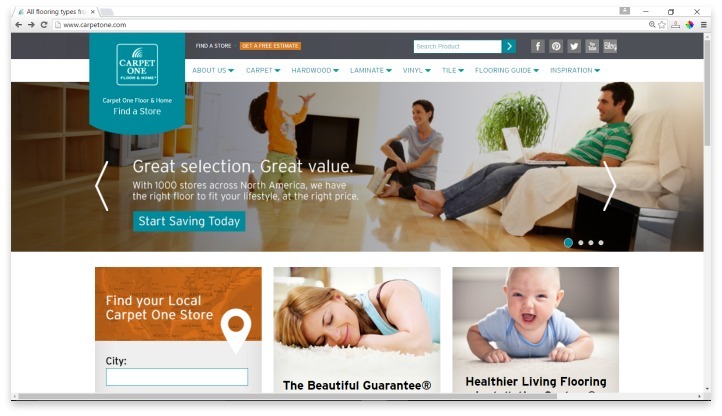 Carpet One showrooms are all individually owned, but work together to get discounted high volume pricing, which is passed onto the consumer. Carpet One showrooms feature various brand name carpet and flooring options. All purchases come with the Beautiful Guarantee, in which Carpet One promises that if the purchaser doesn’t like their new floors, they will be replaced for free, including the installation fee. There are ten brands of carpet to choose from. The Bigelow Stainmaster comes in 52 styles, each with a varying amount of colors. The brand utilizes nylon fibers to make their stain resistant rugs, and the carpet is recyclable. The Innovia line comes in 35 styles, a wide range of colors, and is made partly of renewable materials. It also resists spills and fading, and comes with a life-of-the-floor guarantee. The Innovia Touch is almost the same as the Innovia line, but has more fibers to make it softer than the original. Just Shorn is a collection that is made of wool from New Zealand. The wool makes it hypoallergenic, water-repellant and warm. Relax, it’s…Lees carpets is protected against stains and comes with a 25-year warranty, that covers almost all situations, including accidental stains. Carpet One also carries the Lees Studio line. Another line that repels stains, Resista SoftStyle is made of polyester and comes in 51 styles and a multitude of colors. The Tigressa brand comes in three collections. The Tigressa Cherich collection is softer than the other two, and the available colors were inspired by nature and fade resistant. The Tigressa SoftStyle is created with nylon materials that are recyclable, and the Tigressa H20 line is waterproof, and made for homes with kids and pets. Carpet One also stocks three brands of hardwood flooring, the Laminate for Life brand, three brands of vinyl, and 23 styles of ceramic tile. Many of the locations also carry other household design products, like cabinets, blinds, countertop, and other types of flooring. Carpet One sales professionals go through training that allows them to help consumers make decisions on what type of flooring to choose for their unique situation. After a type is chosen, Carpet One also provides professional installation. Due to the fact that Carpet One showrooms are all privately owned, customer experiences vary widely. Some complaints are due to unreliable installation schedules, during which products were held up for months on end before delivery or installation could take place. Others complained of a lack of quality among customer service professionals who didn’t return phone calls or respond to complaints about the quality of installation or product. On the other end of the spectrum, there are many people who had positive experiences with their purchase from a Carpet One location. They mention how installers went above and beyond to get the job done correctly, they praise the quality of their new floors, and had positive experiences utilizing the Carpet One Beautiful Guarantee. Carpet One has hundreds of styles and colors to choose from, and their staff can help with planning and home design. They also provide a satisfaction guarantee. Carpet One’s satisfaction guarantee makes purchasing flooring a little less anxiety inducing. They have hundreds of styles and colors to choose from, and their staff can help with planning and home design. Customer experience varies from location to location, so consumers should feel comfortable with the sales staff they work with to ensure a helpful experience in case something goes wrong. Have you had an experience with this company? Please share your Carpet One reviews below. Carpetone installed carpet in our entire basement a couple of years ago and we have been thrilled with the experience overall.